Beautiful stained glass Mahi Mahi/dolphin in vibrant shades of green, blue & golden yellow. Fins & tail shimmer in a rainbow of iridescent hues. Hand painted & fused detail make this an excellent gift for the sportsman in your life. 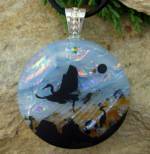 Measures 11" x 33"
Fused round dichroic glass pendant. Beautiful shades of blue with gold dichroic sky. Black enamel bird trio is fused into the glass, will not fade, scratch or wear. Approx. size is 2-1/8" with bail. Shipping and tax applied at checkout. 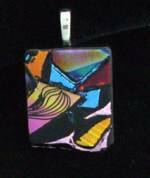 Fused rectangle dichroic glass pendant. Featured are brilliant shades of orange, coral and yellow mingled with sparkling dichroics. 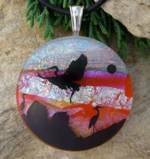 Black enamel bird trio is fused into the glass, will not fade, scratch or wear. Approx. size is 1-3/8" x 2-1/8" with bail. Shipping and tax applied at checkout. 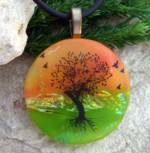 Fused round dichroic glass pendant.Beautiful sunset is alive with orange & coral background & brilliant dichroics. Black enamel bird trio is fused into the glass, will not fade, scratch or wear. Approx. size is 2-1/8" with bail. Shipping and tax applied at checkout. Fused round dichroic glass pendant. 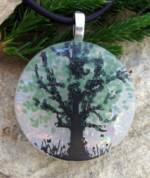 Black enamel forest scene is fused into the glass, will not fade, scratch or wear. Approx. size is 1-5/8" with bail. Shipping and tax applied at checkout. Fused dichroic round glass pendant. Multiple layers of etching add interesting depth to this unique pendant. Approx. 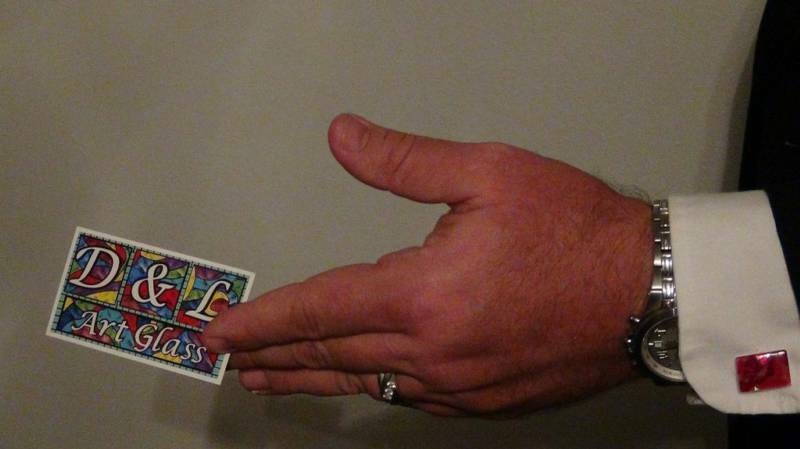 size including bail is 1-3/4". Shipping and tax applied at checkout. 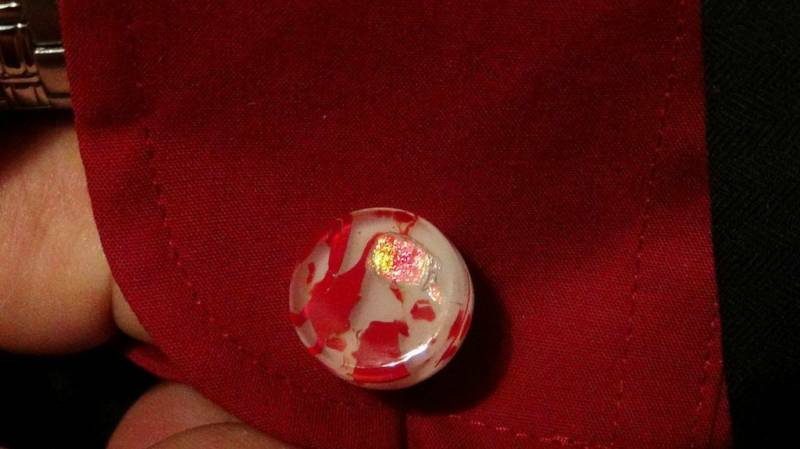 This round design features red shards of glass fused on a white glass background with just a touch of gold dichroic. Make this unique pair part of your collection today. Shipping and tax applied at checkout. Cutting edge style is the word for these beautiful fused glass cuff links. This rectangle design features red & white glass nuggets fused onto a red background, very unique. Add this smart pair to your collection today. Shipping and tax applied at checkout. Matching your outfit will be a breeze with this palette of beautiful dichroic glass colors. 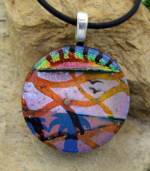 This pendant is fused and hand-etched to bring out the vibrant colors in this gorgeous round piece of wearable art. Size is approx. 1-1/2" with silver plated bail. Shipping and tax applied at checkout. Matching your outfit will be a breeze with this palette of beautiful dichroic glass colors. This pendant is fused and hand-etched to bring out the vibrant colors in this gorgeous rectangular piece of wearable art. Size is approx. 1" x 2" with silver plated bail. Shipping and tax applied at checkout. Matching your outfit will be a breeze with this palette of beautiful dichroic glass colors. 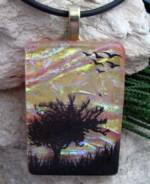 This pendant is fused and hand-etched to bring out the vibrant colors in this gorgeous rectangular piece of wearable art. Size is approx. 1" x 1-3/4" with silver plated bail. Shipping and tax applied at checkout. Matching your outfit will be a breeze with this palette of beautiful dichroic glass colors. 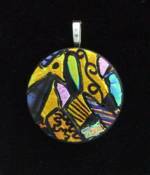 This pendant is fused and hand-etched to bring out the vibrant colors in this gorgeous rectangular piece of wearable art. Size is approx. 3/4" x 1-3/8" with silver plated bail. Shipping and tax applied at checkout. 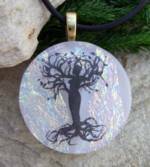 This fused glass pendant features a black enamel decal of a fairy sitting atop a mushroom. The multiple shades of dichroic glass sparkle & shimmer endlessly on the white glass background. The decal is fused into the glass, will not scratch, fade or wear. Pendant size including silver plated bail is approx. 1- 3/4". Tax and shipping applied at checkout. 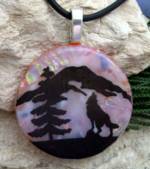 Lone wolf howling into the evening sunset is depicted in this unique fused dichroic glass pendant. Multi-shades of white, blue & orange streak the background while multi shades of dichroic sparkle in the background. Black enamel is fused into the glass, will not fade, scratch or wear. Approx. size including silver plate bail is 1-3/4". Tax and shipping applied at checkout. 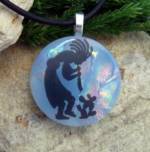 The flute playing cassanova of the Southwest is depicted in this lovely dichroic fused glass pendant. The black enamel decal is fired into the glass, will not scratch, fade or wear. Size is approx. 1-5/8" including silver plate bail. Tax and shipping applied at checkout. Multi-dichroic fused glass pendant. Hand etching outlines each featured dichroic color. Cabachon is in a silver plate ruffled setting. Pendant size is 1-5/8". Chain or cord pictured is included. Shipping and tax applied at checkout. 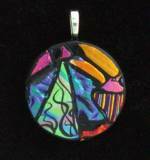 Multi-colored dichroics emblazon the sky in this gorgeous fused glass pendant. Mother giraffe and calf at rest in this scene are of black enamel that is fused into the glass, will not fade, scratch or wear. Pendant size is 1 -5/8" including silver plated bail. Tax and shipping are applied at checkout. Fused dichroic glass pendant. Features stately tree of life enamel decal with green foliage on sparkling green, & gold dichroics on a white base glass. Pendant measures 1-5/8" with silver plate bail. Tax and shipping applied at checkout. Fused dichroic glass pendant. 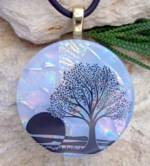 Features stately tree of life black enamel decal with sunset on sparkling multi-color dichroics on a white base glass. Pendant measures 1-3/4" with gold plate bail. Decal is fused into the glass, will not fade scratch or wear. Tax and shipping applied at checkout. 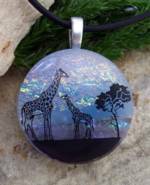 Fused dichroic glass pendant featuring stately TOL in black enamel. 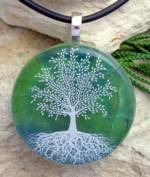 This enamel tree is sits on a bed of white glass & sparkling gold & green dichroics. Pendant size is approximately 1 -3/4" including gold plate bail. Enamel will not fade, scratch or wear. Tax and shipping applied at checkout. Fused dichroic glass pendant. Features tree of life black enamel decal with circling birds on sparkling multi-color dichroics on a orange, green and gold base glass. Pendant measures 1-3/4" with gold plate bail. Decal is fused into the glass, will not fade scratch or wear. Tax and shipping applied at checkout. 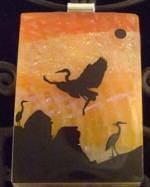 Gold dichroics shimmer brilliantly behind this black enamel TOL with birds in flight overhead. The base glass is a beautiful sunset orange & white. Black enamel is fused into the glass, will not fade, scratch or wear. Pendant size is 1-1/8" x 2" including gold plate bail. Tax and shipping applied at checkout. 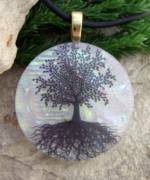 Mother nature unleashed in this unique "tree of life" design. Black enamel stands out on this sparkling fused glass, white dichroic background. Enamel will not fade, scratch or wear. Approximate size is 1-3/4" with gold plated bail. Tax and shipping applied at checkout.